This Teacher's Manual is designed to help the instructor actively engage students in discussions, activities, and reviews that investigate the roles of and relationship between human reason and divine faith in the Christian life. It is a companion to the textbook Faith and Revelation: Knowing God Through Sacred Scripture. The textbook, Faith and Revelation: Knowing God Through Sacred Scripture, corresponds to Book I: The Revelation of Jesus Christ in Scripture in the curriculum framework. 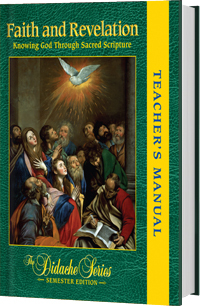 The textbook (sold separately) is published with ecclesiastical approval from the Archdiocese of Chicago, and it has been granted conformity with the Catechism of the Catholic Church by the USCCB Subcommittee on the Catechism. MTF restricts access to its Teacher's Manuals to ensure they remain an aid to the teacher and not a resource for the student. For that reason, MTF normally ships this Teacher's Manual only to a school; if you would like a copy shipped to somewhere other than a school or to see the policy for review copies, please click here to contact MTF.